In 2013, Ross Gittell, chancellor of the Community College System of New Hampshire, identified and quantified the two New Hampshires – one “metro,” consisting of Hillsborough, Merrimack, Rockingham and Strafford counties, and the other “rural,” consisting of Belknap, Carroll, Cheshire, Coos, Grafton and Sullivan counties. The “metro” counties account for nearly three-quarters of the state’s population and employment while their residents enjoy higher levels of income and education and lower rates of aging and poverty than their rural counterparts. In August, the NH Fiscal Policy Institute issued a more refined analysis — “Measuring New Hampshire’s Municipalities: Economic Disparities and Fiscal Capacities.” The report surveys the disparate fiscal capacities of cities and towns throughout the state, together with social and economic characteristics associated with them, to suggest there are not just two but a handful of “New Hampshires,” each found in almost every corner of the state. In New Hampshire, where property taxes fund some 60 percent of municipal expenditures, assessed valuation per capita measures the fiscal capacity of cities and towns to fund public services, facilities and amenities. Municipalities with relatively low property valuations are hard-pressed to raise funds for these public investments, especially public schools, without placing ever more onerous burdens on property owners. These municipalities lie beyond easy reach of metropolitan Boston and outside the corridors carrying the turnpike and interstate highway systems. Nor, with few exceptions, are they situated amid the seaside, lakes and mountains where retirement and seasonal homes have drawn affluent residents and added property wealth to many rural communities. Meanwhile, saddled with high property taxes, challenged school systems, limited economic opportunities and aging populations, these municipalities face greater burdens in trying to expand their tax bases, balance their demographic profiles and build social and economic capital and by attracting residential development and commercial investment. Any quantitative criterion for identifying “property-poor” municipalities is liable to be questioned as either too narrow or too broad. Here “property-poor” refers to those cities and towns with more than 1,000 residents where the assessed property value per capita is less than 65 percent of the statewide median. Applying the 2017 municipal property valuation reported by the NH Department of Revenue Administration and the 2016 municipal population estimates reported by U.S. Census Bureau, the median local assessed valuation per capita of the 234 municipalities, excluding unincorporated places, was $117,336. Among the 185 municipalities with populations of more than 1,000, the assessed valuation per capita was less than 65 percent of the statewide median in five cities and 14 towns (see chart). While evaluations have rebounded since the Great Recession in most municipalities, in 2017 they remained below their peak in 2008 in 16 of these 19 municipalities: in Greenville by 27 percent, in Northumberland by 20 percent, in Berlin and Pittsfield by 15 percent, in Boscawen by 12 percent and in Haverhill and Newport by 11 percent. In FY 2017, total public school expenditures in New Hampshire were $2.9 billion, easily the largest single municipal expense. Property taxes of $2.2 billion — local and state — represented 71.7 percent of the revenue funding public schools. In 10 of these same 19 municipalities, the equalized property value per pupil was less than half the statewide average of $983,646 and was less than 60 percent of the average in the rest. While evaluations have rebounded since the Great Recession in most municipalities, in 2017 they remained below their peak in 2008 in 16 of these 19 cities and towns: in Greenville by 27 percent, in Northumberland by 20 percent, in Berlin and Pittsfield by 15 percent, in Boscawen by 12 percent and in Haverhill and Newport by 11 percent. 27 percent in Claremont and Newport and 24 percent in Rochester, but no more than 20 percent in the remaining municipalities and only 10 percent in Berlin and 13 percent in Farmington and Franklin. New Hampshire, as we know it today, is the result of four decades of robust population growth between 1960 and 2000, when the population more than doubled from 606,921 to 1,235,786. 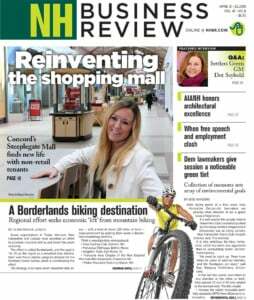 But, the four southeastern counties — Hillsborough, Rockingham, Merrimack and Strafford — accounted for 80 percent of the population growth as well as most of the investment in residential, commercial and industrial development it has generated. While most of the 19 municipalities gained residents, the population in Berlin, Claremont, Northumberland and Lisbon either shrank or stalled. Between 1960 and 2010, the population of Berlin has fallen at every census and has dropped by more than 40 percent, from 17,821 to an estimated 10,413 in 2016. In Claremont the population was 13,563 in 1960 and 12,957 in 2016. Among the cities, Rochester, which swelled from 17,938 to 29,752, and Somersworth, which grew from 8,529 to 11,766, posted the strongest growth while among the towns, populations doubled in Allenstown and Farmington and increased significantly in Boscawen, Charlestown, Pittsfield and Winchester. Population growth stalled throughout the state at the turn of the century. Estimates for 2016 indicate that populations in 15 of the 19 property poor municipalities have either fallen or risen only marginally since 2000. Projected population growth through 2040, prepared for the Office of Strategic Initiatives, indicate numbers will fall in Berlin, Greenville, Northumberland, Claremont, Allenstown and Newport. While the state population is projected to grow 8.8 percent, just six of the 19 property-poor municipalities — Boscawen, Farmington, Haverhill, Northfield, Pittsfield and Rochester — are expected to match or top this pace. Since deaths will far exceed births in the coming years, migration from outside the state will account for the projected growth. All of the 19 property-poor municipalities are aging rapidly. The Census Bureau estimates the state median age at 42.4 years. Only in Somersworth is the median age under 40. The median age in Northumberland (46.7), Charlestown (45.7), Newport (44.8), Greenville (44.3), Pittsfield (43.4) all top the state median age of 42.4. Median household incomes in all these municipalities are below the $68,485 figure for the state. Median household incomes range from a low of $36,654 in Northumberland to a high of $65,690 in Northfield, with a median for the group of $51,866, or 75 percent of the statewide median. Nor are residents of these municipalities wealthy, measured by home values, which generally represent about 40 percent of household net worth. In May, the NH Association of Realtors reported that the median home price in the state had reached $284,000, topping the record of $280,000 set a year earlier. According to data compiled by Zillow, the median home price is $86,500 in Berlin, $122,100 in Claremont, $139,500 in Lisbon, $145,100 in Newport, $146,300 in Winchester, $176,900 in Franklin. With median prices of listed homes of $249,900 and $230,000, Somersworth and Rochester posted the highest home values among the 19 municipalities. While the statewide poverty rate of 7.3 percent is the lowest in the country, the Census Bureau reported that in 2016 the poverty rates in 16 of the 19 cities and towns exceeded the statewide rate. In Berlin, Lisbon and Franklin nearly one in five residents lived in poverty while the number was more than one in 10 in 11 other municipalities. At the same time, relatively high proportions of residents in these municipalities were receiving food stamps through the Supplemental Nutrition Assistance Program, or SNAP. In 15 of the municipalities at least one in 10 residents received food stamps, while the numbers approached one in five in Berlin, Claremont, Winchester, Franklin and Newport. Likewise, the number of schoolchildren who qualify for the free and reduced price lunch program in all of the property-poor municipalities well exceeds the state average of 26 percent. In the 2017-2018 school year, more than half the students qualified in Berlin, Claremont, Charlestown, Franklin, Pittsfield, Winchester, Farmington and Newport. 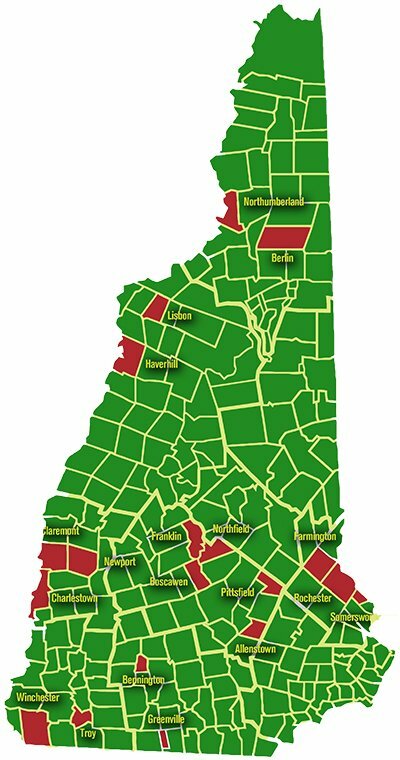 While the aggregate population of the 19 municipalities represents less than 10 percent of the statewide total, these cities and towns account for about 15 percent of Medicaid enrollment in New Hampshire. Medicaid enrollment amounts to 28 percent of the population in Claremont, 26 percent in Berlin and Franklin, 25 percent in Newport and Winchester and between 20 and 25 percent in nine of the other 14 municipalities and more than 15 percent in the remaining five. In addition, public policies that serve to reduce the fiscal capacity of cities and towns while adding to the costs of municipal governments have weighed disproportionately on property poor municipalities. Municipal tax bases are diminished by the extent of land area enrolled in the current use program, protected by conservation easements or held in public ownership, which is either taxed at a discounted rate or exempt from taxation altogether. According to the Department of Revenue Administration more than half the acreage of 17 of these 19 property-poor municipalities is taxed at less than its full market value or not taxed at all. The portion of discounted or non-taxable acreage in Berlin is 87 percent, in Northumberland 85 percent, in Winchester 81 percent, in Haverhill and Lisbon 79 percent, in Boscawen 78 percent, in Allenstown 76 percent, in Troy 73 percent, in Newport 73 percent, in Claremont and Pittsfield 68 percent and in Bennington, Northfield and Greenville 66 percent. Moreover, since 2009 the state has increased fiscal pressures on cities and towns by withholding state aid from them and transferring state obligations to them. Revenue-sharing was suspended, depriving municipalities of some $200 million in aid since 2010. At the same time, the distribution of receipts from the rooms and meals tax was reduced by $58 million during the same period. And the state eliminated its contribution of 35 percent to the cost of pensions for police officers, firefighters and school teachers. These reductions in state funding shifts costs to local property taxpayers, a burden that weighs especially heavily on property-poor cities and towns. The most substantial cuts came in 2017, when the Legislature began reducing state aid to public schools by phasing out the so-called “stabilization grants,” which since 2012 had replaced “fiscal disparity aid” of $1,250 to $2,000 per student to municipalities with low property values and median family incomes. The grants were introduced to hold districts harmless from these changes, which weighed especially heavily on property-poor districts. Berlin, Northumberland, Newport, Greenville, Pittsfield and Haverhill are among the 10 municipalities most severely affected by the reduction and elimination of the stabilization grants. Meanwhile, Claremont, Charlestown, Franklin, Northfields, Pittsfield and Allenstown have formed a coalition to reverse the policy. While distinctions between “metropolitan” and “rural” communities and between regions within the state must not be ignored, they tend to mirror distinctions common to most, if not all, states. More telling are the disparities in fiscal capacity arising from differences in property wealth, which are exacerbated and perpetuated by tax and public policies peculiar to New Hampshire.